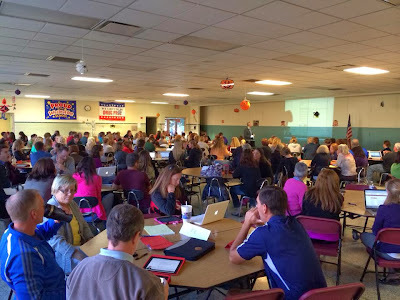 While students were enjoying a day off from school, New Richmond Exempted Village School District administrators and certified staff spent Oct. 14 preparing for the new Ohio Teacher Evaluation System (OTES) and writing Student Learning Objectives (SLO) that will be used in future evaluations. Half of each NREVSD teacher's evaluation beginning this year will come from how much their students learn over the course of the school year. If available, teachers must include the Ohio Department of Education’s Value-Added data in the student growth measure. If Value-Added data is not available, districts can use other assessments such as state approved national testing results or locally developed SLO. A SLO is a target that a teacher sets at the beginning of the year for all students or for a subgroup of students and demonstrate a teacher’s impact on student learning. The challenge for measuring student growth is that not all teachers can use the same assessment or in subjects where traditional assessments are not an option (such as art, music or physical education). NREVSD Supt. Adam Bird created a district SLO committee that met last week to kick start SLO planning that was presented at the Oct. 14 in service session. Committee members included Supt. Bird, Monroe Elementary principal Joe Roach and NREVSD teachers Kelly Schmittou, Tim Cook, Misty Cresap, Greg Chandler, Megan Allen, Tina Grippa, Allie Ball, Stacy Gibbons, Nicole Parker and Bill Harris. The other half of a teacher evaluation under OTES is an evaluation that includes a teacher’s performance rating that is based on a professional growth plan and a minimum of two observations.